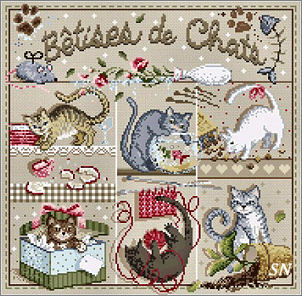 This is a collection of fun charts -- direct from France! 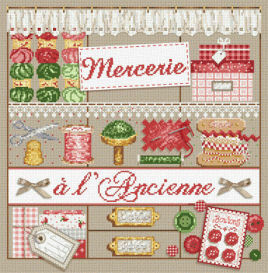 All are presented in French -- but thank goodness, DMC IS A UNIVERSAL LANGUAGE for stitchers!!! 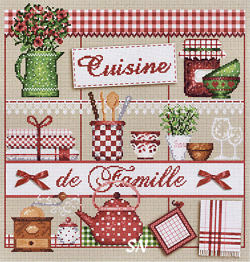 All are offered in chart format, a few include button embellishments. They *are* on the *pricey side* of charts... but, like you, I am a stitcher who cannot pass by the neatest stuff... just because the 'Stash Budget' strains at the cost of the initial investment! 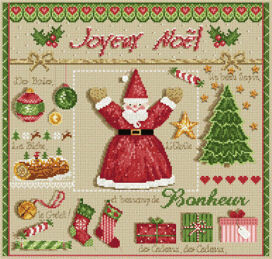 Just darling...each is coded for Anchor thread as well... so ENJOY! 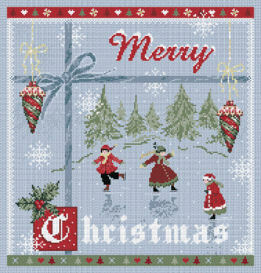 Always 180-ish square in stitch count - that makes them turn out 10 x 10 on 18/36ct fabric. Classy and colorful, these are always cute! Coded for regular DMC floss, each is kind of segmented off, and features beautiful individual design elements. You don't HAVE to stitch them in their entirety, spend a minute and really study them to find your favorite parts! Coming from France, there are some English instructions inside and lovely, clear, colored charts. Each does include a charm embellishment of some sort, but I don't want to open packages; I can feel that they are in there! 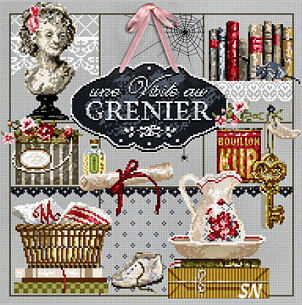 We have two new designs by Madame la Fee. 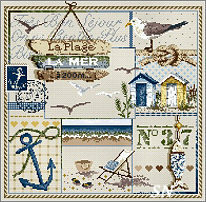 Presented in charts, each measures approx 190 stitches square, so they finish about 12 x 12 on 32ct. 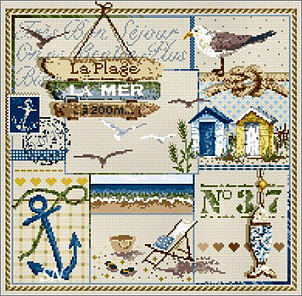 Always charming, her things all feature kind of a 'block format' so they make into very attractive 'medley' designs. I especially like that teddy bear one for a baby's room. 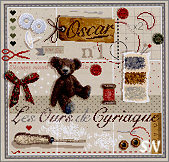 Even though they are coded for DMC, you COULD stitch that bear in a little of Gentle Art's Simply Wool! AND... you COULD add metallics to that Ocean-y one!!! We know the prices on these are kind of high... 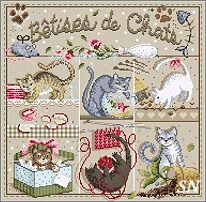 I cannot control that... ... but I do know that they are charming when they are stitched!!!!! 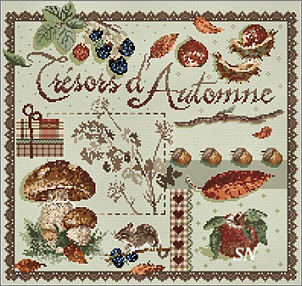 We carry super-endearing patterns by Madame La Fee. A very unique design look, all of them are offered as charts and finish quite large in size. 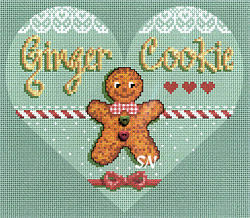 Charted for DMC floss... they are all approx 200 x 200 in stitch count and are cute as can be. All printed in French, so I can't read them... I love them ALL anyway! 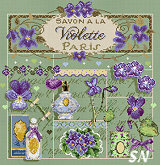 So, a new nautical design and gorgeous violets, they join our collection! 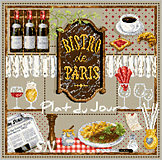 A perfect Paris lunch!!!! What a classy kitchen pic! There is even a copy of the morning newspaper there, complete with food reviews I would think!!! 190 x 188. Elegant tea in the afternoon? I just love everything about this design! Look at that awesome clock face... the Eiffel Tower near the bottom, the lights... all of it together, I love it! 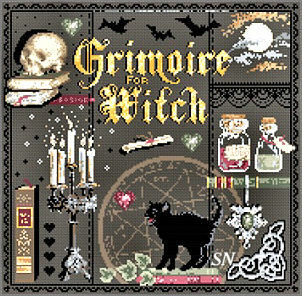 188 x 179 stitches. All the treasures in the attic... the baby shoes, an old box tied with string, that gorgrous striped hat box, the old skeleton key, the spider is just a bitty thing dangling there!!! Have you found the mouse tip-toeing past the leather books??? This is just such a pretty composition... another one for an elegant guest room that is decorated with antiques. 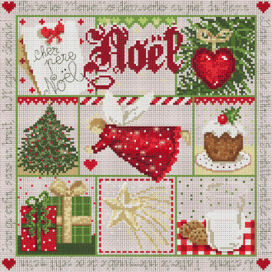 192 x 188 in stitch count, choose a light grey rather than a fabric that has yellow undertones to it... the chart includes the cut of soft pink ribbon hanger. 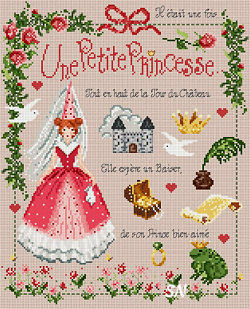 If you need the words to be in English... they can be translated online... but we know this says something about a little princess, her chateau and that frog she's going have to deal with!! 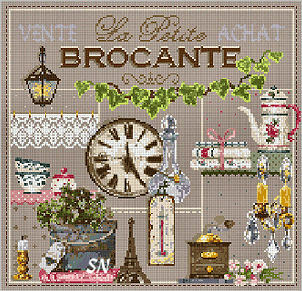 154 x 189 Stitches, this is shown on a pale pink, and uses 39 different colors. Just like the Green Study... this is everything red! 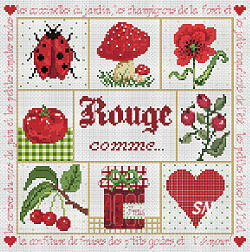 The ladybug caught my eye first, then the poppy, then the cherries... and then I just like the whole thing together! 138 x 138 Stitch Count. I wish I could read the entire verse... something about loving something that is red... doesn't matter... the design is very eye-catching! I think this is a study of all that is green! I bought it because people love frogs and shamrocks. 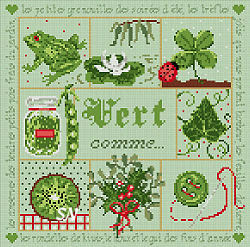 But gosh... the kiwi is so unusual, the ivy is lovely, and the peas and preserves are darling! Once you devour this entire piece... you love it ALL! 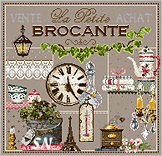 138 x 138 Stitch count. Diary Books, locks and keys, potions & perfumes, letters, flowers and that darling well-loved teddy bear... this piece is full of romance. Stitch it for a young girl -- wouldn't this be pretty on a photo album cover of her baby pictures? 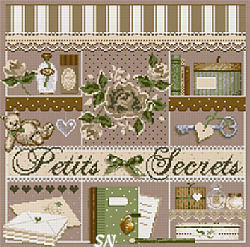 Elegant shades of taupe, ivory and moss greens, stitch count of 185 x 184. 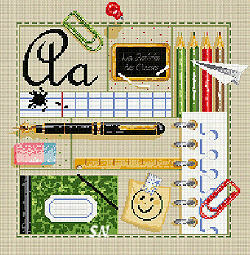 For teachers and schoolrooms -- pens, pencils, erasers and the blackboard -- this is a collage of everything school! 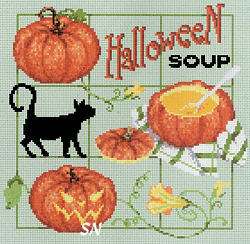 179 x 182 Stitch count, this would make a neat gift for a new teacher! I think this is just good old fashioned cooking for the family! Red satin ribbon for the bows is included, along with heart charm. 181 x 188. 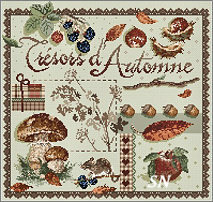 A pretty medley of Autumn scenes, this measures 180 x 180 stitches, and includes a tiny embellishment that is a bunch of grapes or cluster of acorns. (They come in a little french papered envelope, sealed with a sticker... and I don't want to open the tiny bag and ruin the presentation! I'm holding that little french paper bag up to my desk lamp to see the embellishment! I just can't break that little seal! Fun things about Winter! 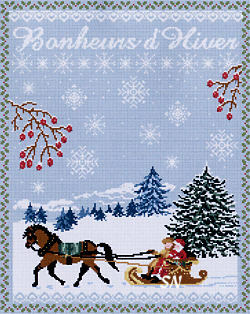 That sleigh ride through the snowy countryside... stitch count is 181 x 227. 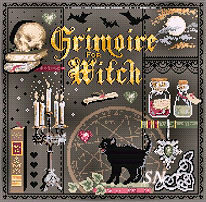 This celebrates the Halloween Holiday without witches, skeletons and ghosts! Very cute and classy, stitch count of 136 x 132, the charm included looks like a little pig to me! Not sure why... but go with it... and raid your stash if you want, for other options!!! Cute! Oh my gosh, TOO CUTE! He's only 120 x 102... and still big to our standards! Two little heart button embellishments... how can you not love this one? 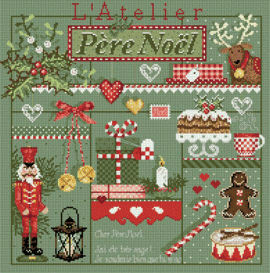 190 x 190 chart includes a brass nutcracker charm that I don't see on the cover image! 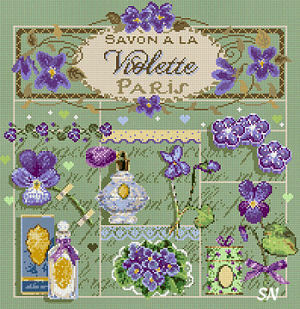 189 x 180... chart includes 20-ish teeny-weeny colorful button embellishments. 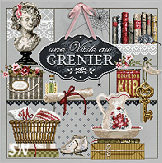 This is a charming scene, full of Retro-flavor! 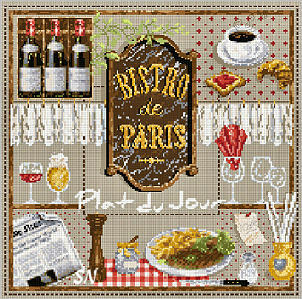 179 x 188 Stitch count... this is actually quite large. I like the idea that it looks like you're looking through a window, or that it reminds me of a package! Chickens and Eggs!!! What a charming piece! 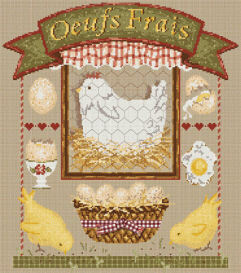 Stitch count of 182 x 205, the chart includes a piece of checkered ribbon to tie onto the basket, and a little brass egg charm. Can't read a word that is running along this piece's border... but I imagine you can use the babel-fish thing on Google, and find out!!! 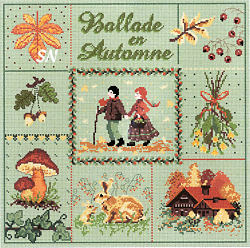 138 x 138 Stitches, I love that tree! Another tiny brass embellishment is included -- packaged in a tiny, colorful little paper bag! (Oh, I'm learning lots of new ways to spell words with all these patterns!) Sewing! Isn't this a neat piece? Measures 181 x 181, the brass charm included is a little key. Cherries and more Cherries! 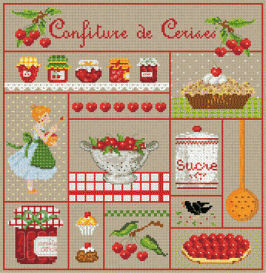 Pies and jams and jellies... cute for your kitchen! 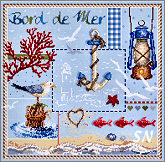 Stitch count of 169 x 174.